French President Emmanuel Macron pays his respects by the Tomb of the Unknown Soldier during a commemoration ceremony for Armistice Day, 100 years after the end of the World War I, at the Arc de Triomphe, in Paris, Nov. 11, 2018. At the 11th hour of the 11th day of the 11th month -- precisely 100 years after fighting halted in the first world war -- leaders from more than 60 nations -- the majority of countries that sent troops or workers to the Western Front -- gathered at the Arc de Triomphe to remember the millions who died in the conflict. French President Emmanuel Macron, at the Tomb of the Unknown Soldier under the arch, lit the eternal flame that is rekindled every night at the memorial engraved with the words: "Here rests a French soldier who died for the nation." French President Emmanuel Macron lights up with children the Tomb of the Unknown Soldier under the Arc de Triomphe during ceremonies, Nov. 11, 2018 in Paris. In his address, Macron spoke of the sacrifices of lives made a century ago in the four years of carnage in Europe. "Old demons are reawakening, ready to sow chaos and death," warned Macron. "History sometimes threatens to repeat its tragic patterns and undermine the legacy of peace we thought we had sealed with the blood of our ancestors." 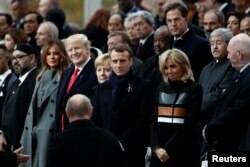 Russian President Vladimir Putin, back to camera, arrives at a commemoration ceremony for Armistice Day at the Arc de Triomphe in Paris, France, Nov. 11, 2018. Macron, later on Sunday, hosted a peace forum, which German chancellor says is meant to demonstrate efforts “to do everything to bring a more peaceful order to the world, even though we know we still have much work to do." French President Emmanuel Macron delivers a speech before a lunch at the Elysee Palace, during commemorations for Armistice Day, 100 years after the end of World War One, in Paris, France, Nov. 11, 2018. Trump, an advocate of a nationalist 'America first' policy, did not attend. Sunday’s somber centenary ceremony, under rainy skies, also featured cellist Yo-Yo Ma, singer Angelique Kidjo of the African nation of Benin and buglers who ended a minute of silence. No soldier from the war is known to still be alive but their voices were present through high school students reading their letters written at the front on this day a century ago. U.S. Army Capt. Charles Normington wrote that "each soldier had his arms full of French girls, some crying, others laughing; each girl had to kiss every soldier before she would let him pass. There is nowhere on earth I would rather be." 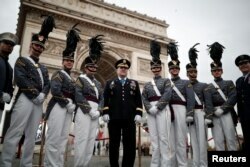 West Point cadets pose before a commemoration ceremony for Armistice Day, 100 years after the end of the First World War at the Arc de Triomphe in Paris, France, Nov. 11, 2018. "Finally, the whir of the shells and the whistling of the bullets are over," wrote French infantryman Alfred Roumiguieres. The four years of battles in trenches was intended – as the British and Americans idealistically insisted -- to be the “war to end all wars.” But little more than 20 years later global conflict would again erupt with casualties on an unprecedented scale. "It is our duty to preserve the civilization they defended and to protect the peace they so nobly gave their lives to secure one century ago," Trump said Sunday at the Suresnes American Cemetery and Memorial near Paris, where more than 1,500 Americans who died in the first world war are buried. 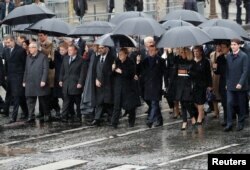 Trump canceled a visit the day before to a different American cemetery about 80 kilometers northeast of Paris, due to what the White House said were scheduling and logistical difficulties caused by the weather. An American delegation led by Chief of Staff General John Kelly and Chairman of the Joint Chiefs of Staff Joe Dunford did visit the Aisne-Marne American Cemetery and Memorial under gray skies and drizzle, paying respect to the nearly 2,300 war dead buried at the site of the June 1918 Battle of Belleau Wood. 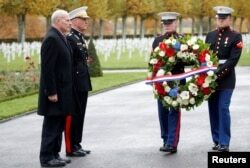 White House Chief of Staff John Kelly attends a ceremony at the Aisne-Marne American Cemetery dedicated to the U.S. soldiers killed in the Belleau Wood battle during World War One at Belleau, France, Nov. 10, 2018. Trump was criticized on social media for remaining in Paris during the afternoon with no other scheduled events, as images were broadcast of French President Emmanuel Macron and German Chancellor Angela Merkel holding hands at the site in the Compiegne Forest, north of the capital, where allies and defeated Germans signed the agreement that ended the war. Some former U.S. officials suggested Trump could have visited the cemetery if he really desired. “There is always a rain option. Always,” wrote on Twitter Ben Rhodes, the deputy national security adviser under President Barack Obama, who explained he helped plan such foreign visits during the two terms of Trump’s predecessor. President Donald Trump and French President Emmanuel Macron gesture during their meeting inside the Elysee Palace in Paris, Nov. 10, 2018. Earlier Saturday, Trump and Macron discussed their differences about European security. 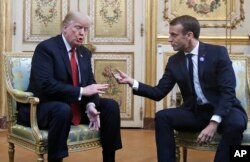 The meeting came soon after Donald Trump arrived in Paris and criticized his host via Twitter, calling Macron's support for a European military force "very insulting." 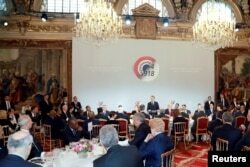 As they began their meeting Saturday morning at the Elysee Palace, the U.S. president again called for better burden sharing for the cost of defending Europe.